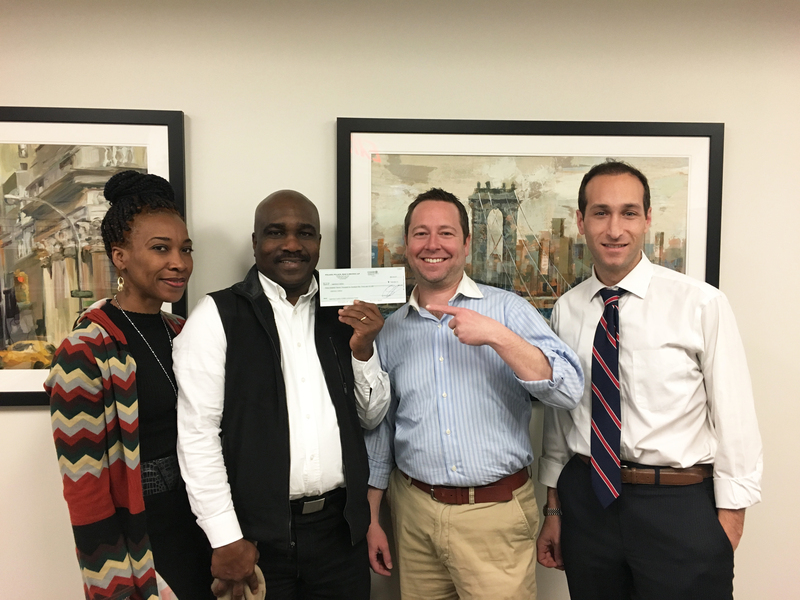 Home / Case Results / New York Uber Accident Lawyer Review: Lawrence C.
New York Uber Accident Lawyer Review: Lawrence C.
Adam Handler and Lawrence talk live right after settling the case for $485,000.00! “I’ve never been so happy in my life as I am today!” -Lawrence C.
On September 18, 2014, Lawrence was working as an Uber driver (rideshare service). As Lawrence cautiously waited for traffic to pass before turning left to pick up a customer, he was rear-ended by another vehicle. The crash propelled his vehicle forward, causing him to crash into an oncoming vehicle (accident depiction below). Lawrence has listened to Adam’s radio show for many years and knew The Case Handler was the right attorney for his case. This case is just another example as to how the right attorney makes all the difference. First, since Lawrence was injured during the course of his employment, he was entitled to Workers’ Compensation benefits. In New York, when you are injured on the job, Workers Compensation is responsible for paying all medical bills and lost wages. The Case Handler team made sure Lawrence received every dollar he lost due to being out of work. In addition, all medical bills were paid. Second, the driver of the vehicle that struck Lawrence claimed that Lawrence stopped short causing the accident. After depositions, we filed a Motion for Summary Judgment under the well settled law that a driver of the rear vehicle must keep a safe distance to avoid striking the vehicle to the front. The Court accepted our argument and found the defendant to be 100% responsible, thus expediting the case and putting pressure on the Defendants to settle or go to trial. The result? The Defendants agreed to settle less than a month later for $485,000.00! Our client, Lawrence, was involved in a unique accident as an Uber driver. Since he was working and operating a vehicle when his accident happened, he could potentially file a personal injury claim and workers’ compensation claim to increase his recovery. Finding every option for our clients is what we do! Whether you are an Uber driver or passenger, we have years of experiencing successfully helping those injured in rideshare vehicles. Contact our New York Uber accident lawyers for a case evaluation. Call 929-223-4195 today.